Maser Gallery show August, 2013. “A Sense of Place,” oil paintings inspired by some of my favorite quiet corners of our lovely town. Stop by the opening on Aug 4 from 3-5. I’d love to see you there. 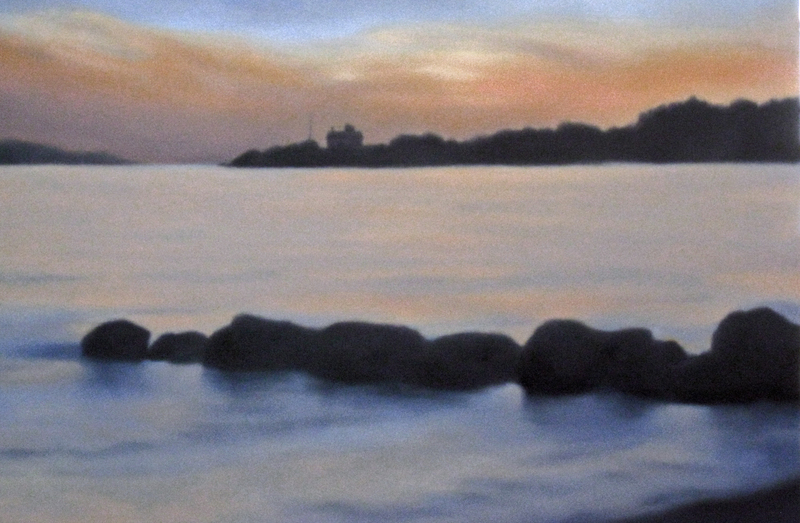 You are all invited to my exhibit of oil paintings at FCTVs Maser Gallery on Dillingham Ave in Falmouth, MA. The exhibit will run from Aug 2 to Aug 30. A reception will be held Aug 4 from 3 to 5 PM. I hope you can join me there. This past winter I decided to give myself the challenge of consistently working on a larger scale. The 20″x30″ canvas size allowed the exploration of new possibilities. The drama of fading light and stormy skies could be intensified, and in “Winter’s Space” large areas of uninterrupted space and color took on new importance. As usual my kettle pond and the nearby ocean served as inspiration, and my frequent travels across the Mass turnpike yielded images of a different terrain and sky. These paintings are now included in a Show at the Universalist Unitarian Church in Falmouth until the end of May and will be on display at FCTV’s Maser Gallery in August. 2012 has come and gone with a flurry of new art activity. A new gallery is showing my work and I have had a great time working with friends to create group shows in various venues about town. 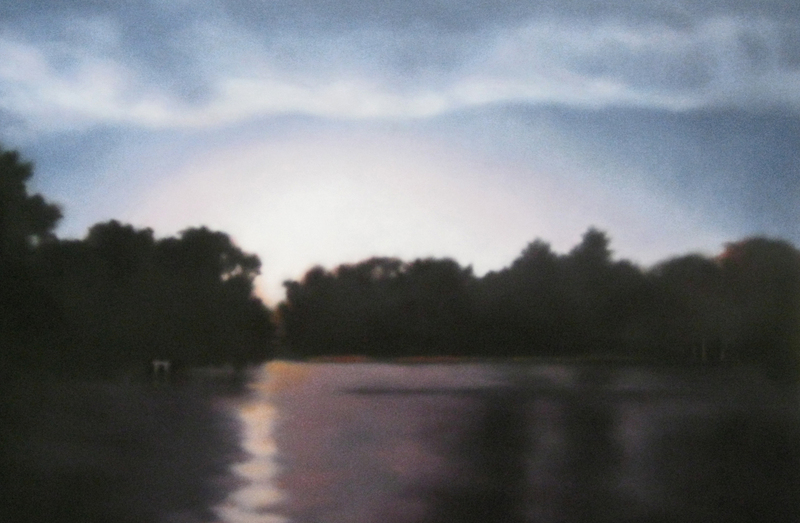 New ventures in 2013 will include solo exhibitions at the Universalist Unitarian Church of Falmouth and an August show at the Masur Gallery at FCTV. 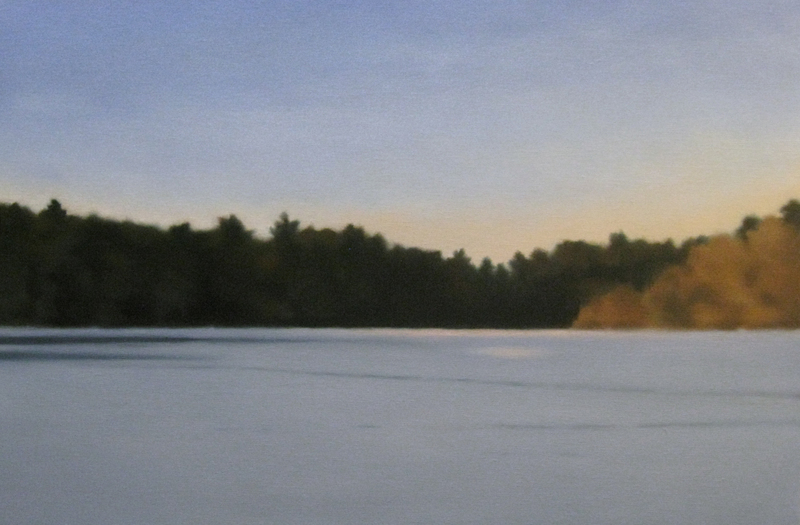 I will continue to show works at Cape Gallery Framer in Falmouth and at SRD Danton Studios in South Dennis. 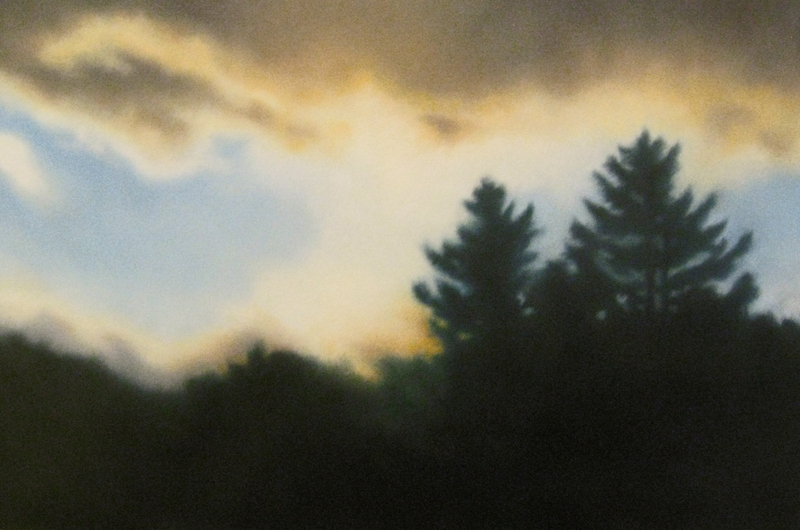 I also continue to offer oil painting classes at the Falmouth Art Center. Doing demonstration paintings for my students has opened up some new ways of thinking and the desire to branch out into larger, more stripped down versions of landscapes. The small works done for the class left me feeling as though my world had been too scaled down and safe. So the goal this winter is to work on pieces 20″ x 30″ or larger and see where this takes me. It is good for artists to mix it up and push into unfamiliar territory. Drama and bold gesture are possible in a larger format so stay tuned and I will post more in a month or two. 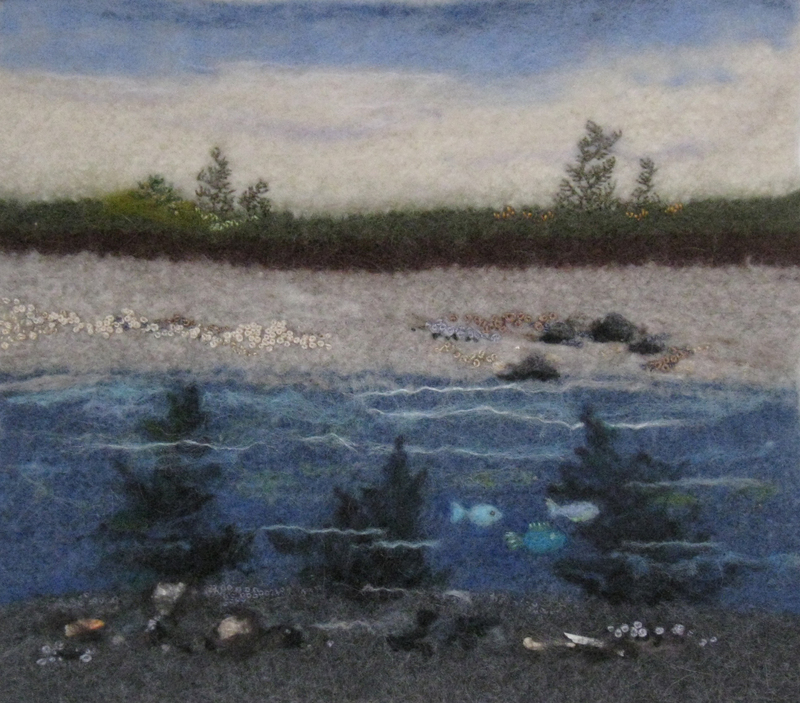 Here is another knitted and felted piece inspired by the discovery of buried cedar stumps under the water and sand on our southern shore. I immediately wondered what this ancient forest would look like if it were still alive today. This is a work in progress. I have always had a bittersweet feeling at the time the Queeen Anne’s Lace blooms. It is high summer and yet it will end soon. 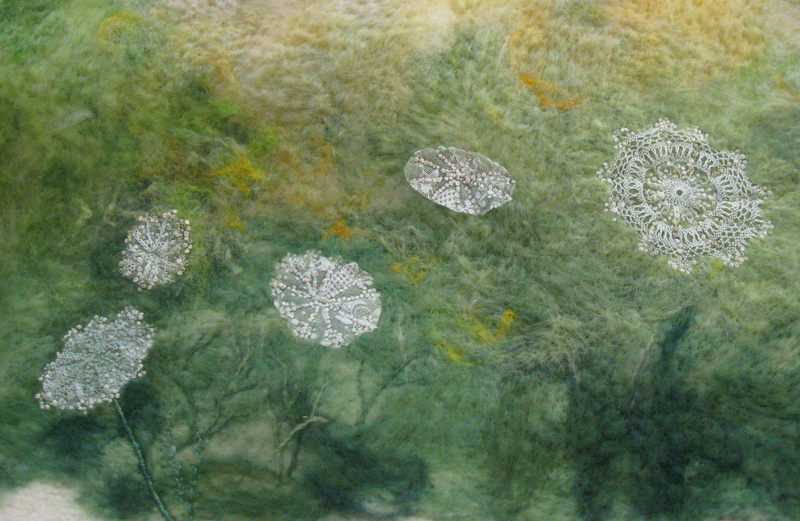 I inherited the lace from a dear friend who passed away some years ago and always wanted to use it in a piece that addresses memories of fleeting moments. 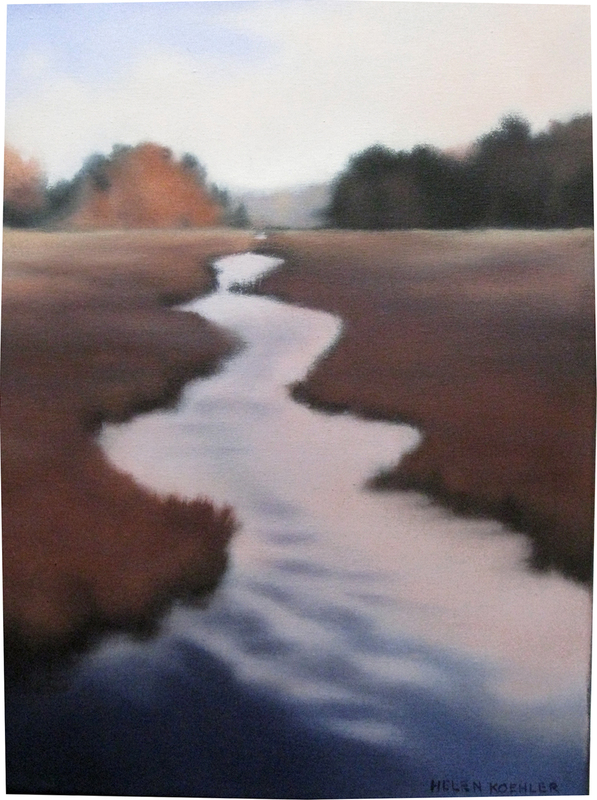 This is a second effort to portray the Connamesset River, which runs through the cranberry bogs near my house. While teaching this summer and fall, I chose to demonstrate subjects that often challenge painters. Marsh grasses are such a subject and here they are viewed as a flow of shapes with light and shadow giving them form and depth.